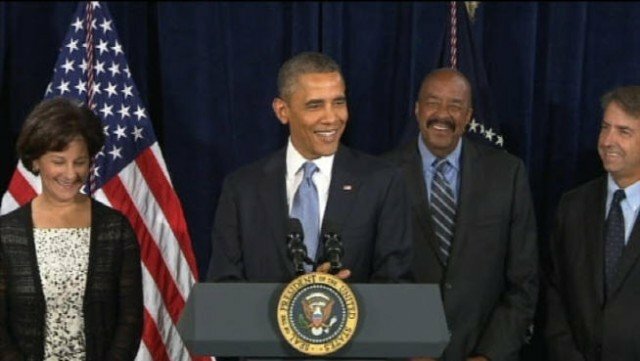 Barack Obama snapped at staffers as he realized they forgot to put his remarks on the podium moments after he tried to begin health care speech in San Jose, California. “It is wonderful to see all of you, and I want to thank everybody who is here,” Barack Obama began. “People!” Barack Obama barked, half-smiling. Barack Obama was in San Jose to remind California journalists and Obamacare-watchers about a partnership between his administration and Spanish-language media networks like Univision, La Opinión and Telemundo. The White House hopes to leverage those networks’ reach into Spanish-speaking households in California, Texas and Florida in order to encourage millions of Americans in Hispanic households to enter health care exchanges that will open for enrollment in October. Overall, an administration official said during a background conference call Thursday, the president’s staff hopes to enroll 7 million Americans, including 2.6 million young people. Nearly 6 million Californians will be eligible for their state’s Obamacare marketplace, 2.6 million of whom will be eligible to receive tax credits or other subsidies to pay their premium. Nearly half of that subsidy-eligible group is Hispanic, and without their participation the effort will likely fall flat. So what might have been a victory lap in politically comfortable territory quickly became an embarrassment. While the president waited for a staffer to deliver his speech, a reporter in the crowd asked if he would answer a question. The group standing behind Barack Obama, representing the Spanish-language networks and the California Endowment, which has pumped millions into a campaign to enroll low-income Californians, seemed uneasy at the outset because their issue became a secondary concern after a new scandal brewed overnight related to a U.S. digital eavesdropping program. “You can’t have 100 percent security and also then have 100 percent privacy and zero inconvenience,” the president said in defense of the longstanding snooping program. And minutes after protesters shouted at Barack Obama’s motorcade about the Keystone XL fuel pipeline, reporters’ interest was clearly more focused on the eavesdropping scandal than on his health care initiative. Making matters worse for the second-term president, Obamacare itself is reaching new levels of unpopularity in the final months before it fully goes into effect. An NBC News/Wall Street Journal poll released this week shows 49% of Americans say they believe the Affordable Care Act is a bad idea, compared to 37% who support it. Barack Obama’s troubles speaking off-the-cuff have been well-documented since the days of his first presidential campaign. During one 2008 appearance in Bristol, Virginia, Barack Obama fumbled over a hypothetical description of a small child with asthma who didn’t have proper preventive health care. Observers at the event noted that few in the crowd were cheering, yelling or otherwise interrupting Barack Obama. The president later made history when his handlers persuaded the Indian government to allow him the use of a teleprompter when he addressed that nation’s parliament in November 2010. The device had never been permitted there before. “It looks like a podium,” one mystified Indian lawmaker said, according to a Washington Post reporter on the scene. “Where do they place the paper?” asked another. Pope Francis: "Wasting food is like stealing from poor"